Umatrix is a content blocker and filter plugin for Firefox, Chrome and Opera. It gives the user fine-grained control over blocking and allowing of cookies, CSS, images, media, scripts, XHR, frames and other requests done by the browser. Think of it as a firewall for your browser. Effectively, it replaces cookie blockers, ad blockers and script blockers, as well as all privacy enhancing extensions such as Privacy Badger. Because umatrix blocks everything by default, you always remain in control of exactly what each website is allowed to do. Many sites will of course break, but umatrix makes it easy to unblock things either by default or on a site-by-site basis. Umatrix is an extremely powerful tool and unfortunately that means it comes with a bit of a learning curve. This tutorial tries to make that learning curve a little less steep. In this tutorial I’ll be using the Chrome version of umatrix. Other browsers should work similar. Whenever you visit a site, the icon will change to show what’s being blocked and what is being allowed. Clicking on the icon brings up the filtering interface for that website. For this tutorial I’ll use the first article I found on reddit’s front page as the site which we’ll be blocking and allowing content on. This is the scope selector. It determines on what level (global, domain, subdomain) blocking and unblocking elements has an effect. Basically this lets you set defaults for all websites or specific websites. Disable / enable matrix filtering. This toggles blocking of all requests for the current scope. Option toggles, such as turning on and off User Agent spoofing. Save all temporary changes you’ve made to the current scope (website). Effectively, this lets you save your preferences for a website. Revert all temporary changes you’ve made to the current scope. This loads the changes you’ve previously saved for this scope, or resets them to the default values if you have no saved changes. Reload current website. Reloads the website without closing the matrix. This is essential for when you need to figure out which resources you should unblock if you want to get a specific part of the website working. Revert all temporary changes. Mostly the same as 5, except for all scopes and all websites. Bring up the logger, which lets you see all requests made by your browser and whether those requests were blocked or not. A row in the matrix and more specifically, the “All” row. Clicking in the columns of the “All” row lets you toggle blocking of that resource for all rows in the matrix. Domain dividers are marked by a larger border between rows than other rows. This subdivides the matrix into areas that have effect on a single domain. The top row in a subdivision toggles blocking for all subdomains in that division. The All Cell, when clicked, toggles between blocking and allowing everything in the matrix. Unlike the “disable / enable matrix filtering” (2) button, these changes can be saved. The 1st party row is special. “1st party” refers to the website that you actually intended to visit. For example, if you go to https://www.reddit.com, then “reddit.com” is a 1st party website, and so is everything under reddit.com. Anything not under reddit.com, such as https://i.redd.it, is not considered 1st party. Dark-red colored cells are blocked. Dark-red colored cells in the first column point to either manaully blocked or filter list blocked domains. Umatrix supports filter lists just like most ad blockers do. light-red: The resource is blocked by default. dark-red: The resource has been manually set to be blocked. Dark-red in the domain column (the first one) means that website is being blocked by a block list. light-green: The resource is allowed by default. Dark-green: The resource has been manually set to be allowed. We can see that clicking the top part unblocks (allows) media all the rows / domains. The entire column turns green. The bottom part blocks it again. Since the default was already to block it (light red background), the column does not turn bright red, but just reverts to the default. When we try to block all images, nothing appears to happen. This is because the “1st party” (and thus the domains under “independent.co.uk”) have been manually set to allow. This overrides the “All” setting. We can also see that the “Save” and “Revert” icons become active. If we choose to save our current changes, umatrix will use those settings on our next visit to this page / scope. Otherwise, on a next visit, the default settings will be used again. Each cell shows the number of requests made for the current website. 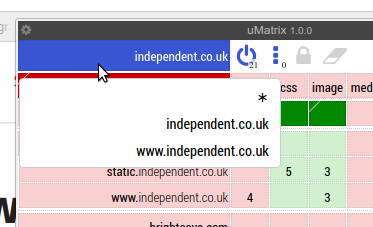 If we wanted to selectively allow scripts from “static.independent.co.uk” and “www.independent.co.uk”, we can click in the top part of those cells and hit reload to refresh the current page. After reloading, you may notice new rows appearing in the matrix. Scripts may try to load additional resources, which may be blocked by umatrix. Once we are satisfied with our changes, we can click the “Save” icon to save those changes for next time we visit this website. You may have noticed the tiny little triangle in the top-left corner of each cell. That triangle indicates the default value for that cell. If you click the Revert button (the little eraser), the cell will revert to the color in this little corner. As you can see there are three scopes: “*” is the global scope, “independent.co.uk” is the 1st-party scope (domain) and “www.independent.co.uk” is the current site scope. The scope determines to which site the blocks and unblocks in the matrix apply, while the various domain rows determines which domains the site may make requests to. Say we start with all resources blocked for everything. Now, we want to enable the loading of images and CSS, but only for 1st party domains. So if we visit https://www.reddit.com, we want CSS and images loaded from https://reddit.com, https://www.reddit.com and maybe something like https://images.reddit.com, but not from https://www.imgur.com or https://www.evil-ads.com. We see that the images and CSS are now enabled for *.independent.co.uk. If we browse to a different site, such as github.com, we’d see that images and CSS are allowed for *.github.com. We visit www.independent.co.uk. On scope www.independent.co.uk we unblock media for the independent.co.uk domain / row. www.independent.co.uk may now load media from independent.co.uk. However, independent.co.uk’s blocks and unblocks have not changed, so if we were to visit independent.co.uk, it will not have any new rights. We visit www.independent.co.uk. On scope independent.co.uk we unblock media for the independent.co.uk domain / row. We see that this also enabled media for all other domains under independent.co.uk as multiple rows turn green. Now site independent.co.uk as well as any other site under it may load media from any other domain under independent.co.uk. On scope “*”, we unblock CSS for the 1st-party row. Now any site may request any CSS from any of the other sites in that domain. For example, www.independent.co.uk may request CSS from independent.co.uk or from css.independent.co.uk. On scope “*”, we unblock scripts for cdn.coolscripts.com. Any site can now request and run scripts from cdn.coolscripts.com. I suggest blocking everything by default and only enabling CSS and images for first-party sites by default (the “*” scope). This will break a fair amount of sites. You could chose to allow CSS and images from all sites. This will make many sites work a lot better, but you can still be tracked by all those sites. Umatrix puts the amount of convenience you’re willing to sacrifice for security and privacy entirely in your own hands. Set your personal default blocking preferences in the “*” scope, save your changes and switch back to the default scope. Unblock blocked requests if the site does not work properly. Reload using the “reload” button. Repeat until the site works for you. Save your changes if you’ll be visiting this site again. Within a few hours of browsing, most of your regular sites will work properly. Don’t forget that once you’re used to umatrix, you don’t need any other blocking extensions anymore! You can get rid of ublock origin, privacy badger, noscript, and any other extension you may have installed to protect you. One tip before this article ends: You may want to install the Mercury Reader plugin for Chrome. It lets you view articles without all the clutter. It works great in combination with umatrix.